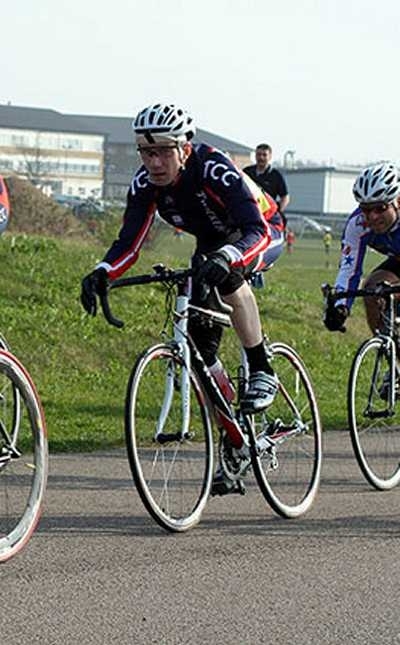 A full day's racing at Hillingdon on Sunday saw 7 Twickenham riders on the menu across 3 of the races. On this day, the circuit was being ridden in a clock-wise direction, prompting many spectators to question why this was not the norm. Our Muse-Bouche in the U16's, Declan Higgins, unfortunately took a tumble whilst well placed. Next on the "carte", the quartet of Dave Peck, Gavin Mitchell, Will McFarland, & Vince Leon retained balance in the 3/4 race. The somewhat "testing" (others might call them "pretty diabolical") conditions encouraged fractious overtones throughout the peleton due to some unconvincing bike-handling skills. Chairman Peck obviously decided that the safest place to ride was out of harms way (i.e. off the front), and embarked upon his customary charge for a couple of laps before being retracted by the peleton, whilst Will, Gavin, & Vince kept snug in the pack. The event was effectively dispatched by Chris Baldwin, who like Dave, thought Time-Trialling was safer than Road-Racing on this day, as did the 2/3rd placed riders who performed competently as a 2-up. 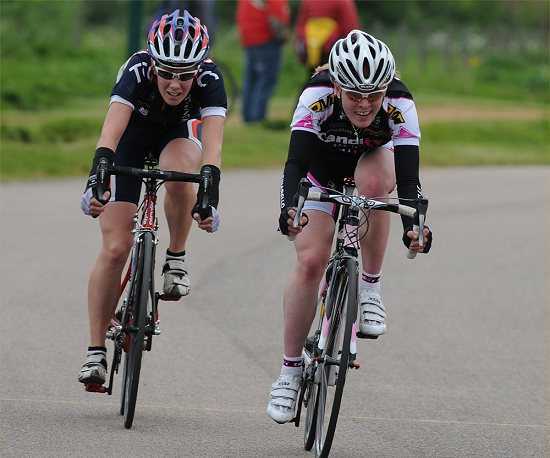 The 3rd course of the bike-fest brought some of the country's finest Lady riders onto the track to contest the 3rd round of National Series, with our Club interests being in the shape of Natalie Creswick & Emma Williams. By this time, if anything, the strong southerly wind had increased, rather than abated, and any benefit from the tailwind on the home straight was cruelly over-ridden by a face-full of Heathrow's finest pollutants on the backside of the circuit. Even before the race had settled in, some riders were ejected from the pack on the very first lap, and left to fend for themselves, circling doggedly for the next hour. The pace seemed inconsistent, and this encouraged many lone forays, notably from Emma Trott, Charlie Blackman, and Natalie. Around half-way through the contest, at around the same time that Emma found the to-ing & fro-ing too draining and joined the ever growing list of retirements, Natalie joined forces with Hannah Barnes, and they immediately took the race by the scruff of it's neck, surging their way to a 15 second break. This break looked extremely good for a number of laps and they worked well together, however, this was a classy field of riders, and the 2 raiders were duly reeled-in, textbook style, on the penultimate lap. The final throes of this contest saw Janet Birkmyre launch herself from 200 yards (verbally assisted by David Jack), and she convincingly overcame Olympic Hopefuls Dani King and Jess Booth, leaving them to scrabble over the lower steps of the podium. The lively Natalie certainly had us shouting for a while, but it was not to be on this occasion. 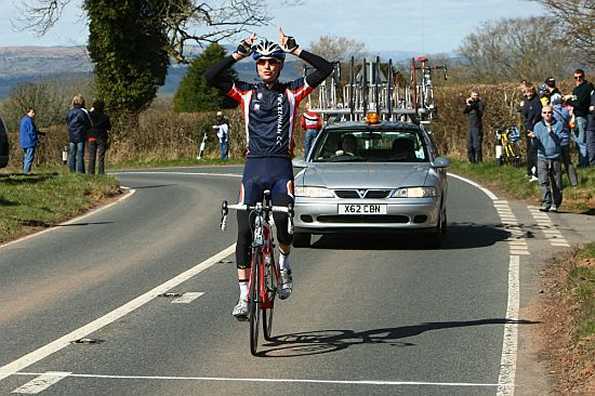 A report, which also features the Elite Men's Race can be found on the British Cycling website. Sunday also saw round 4 of the National Junior RR series, held at Redbridge Cycling Circuit - otherwise known as Hogg Hill, and the temporary replacement for the old Eastways circuit, which has made way for the 2012 Olympics stadium. Sandy King continued his impressive form this season with 7th place, and retains 2nd place overall in the series, 16 points behind Pete Dibben. David Seymour collected his first points on Sunday in the 4th Cats race at Goodwood. Commiserations to those who travelled up to this event, having paid a high entry fee, and trained for months, only for their ride to be ruined by miscreants. Story here. Arriving in good time, I found myself the only Twickenham rider in the 4th cats. There was the seemingly obligatory standing around for 20 minutes in the wind, so everyone without a rollers had a 'cold start'. The race started briskly however, with a rider trying to immediately jump away, encouraging us to get into our stride into the first back straight. 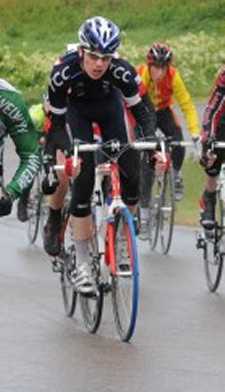 Aiming to keep out of trouble by staying near the front, I found myself leading the bunch rather quicker than intended. 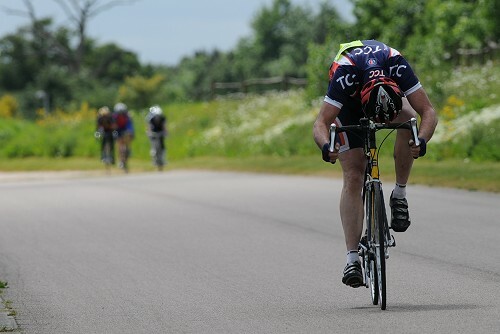 I am learning that if you keep pedalling hard enough in front early on in a race, the riders behind are quite happy to let you continue; team mates do make a big difference, and I missed Will and Darren's help. There was some of the usual 4th cat pattern of riders going off the front only to get quickly reeled back in. However the standard of riding seems to be improving, with the bunch overall well disciplined. This week this extended to tactics. After about 20 minutes a group of around six riders moved off the front. I think the followers were expecting the move to fizzle out; however when they started opening up a gap some reacted. When it became apparent that the break was working well together and might well stay away, I tried to jump the gap. With a 20mph headwind up the rise, I found could not make the gap alone; however when three other riders caught up, we restarted the chase. Apparently, an extra lap was added on, and the commissar could not ring the final lap bell with the E123s so close. The commissars told me that six riders crossed the line in the leading group, another rider behind them, with three finishing in the middle of the E123s (who were not disqualified as the E123s were going slower). So that was the top 10 finishers. Crikey, the third race in a row that I have finished just outside of the points after working hard at the sharp end. As the Finchley RT rider said afterwards though, a most enjoyable race to take part in, and a good training ride.